There are a handful of manufacturers in the world who are renowned for offering robust, stylish and technically sound SUVs, and Nissan is one of them. The KICKS is one such SUV from their global lineup that is available in India. The KICKS’ stand-out design breaks away from the traditional boxy look of the segment, making it instantly identifiable in the crowd. The plush leather-wrapped interiors offer a premium and comfortable experience inside the cabin along with the leather-wrapped steering wheel and gear shift knob. In terms of onboard technology, the Nissan KICKS is loaded with that too. The Around View monitor which provides a 360-degree field of view to navigate tight spots is a first for the segment. All the different viewing angles are displayed on the 8-inch floating touchscreen display for the infotainment system which features Android Auto and Apple CarPlay compatibility as well. The technological marvels of the Nissan KICKS don’t stop there either. It also comes with the NissanConnect suite of apps with over 50 different safety and convenience features. This technology allows KICKS owners to track their car’s location, vehicle performance and vehicle health as well. From finding where your car is parked to tracking where it is in real-time and getting speed alerts if it goes faster than the limit you set, owning a KICKS offers peace of mind. The app suite also has the feature to track the health status of your KICKS in regards to the battery, engine, starter motor and the brake systems. It can also tell you if the driver is wearing a seatbelt, all the doors are closed or not, the fuel level and the nearest fuel station. One can also find the nearest Nissan outlet on the sat-nav and also book a service for the KICKS on the NissanConnect app itself. 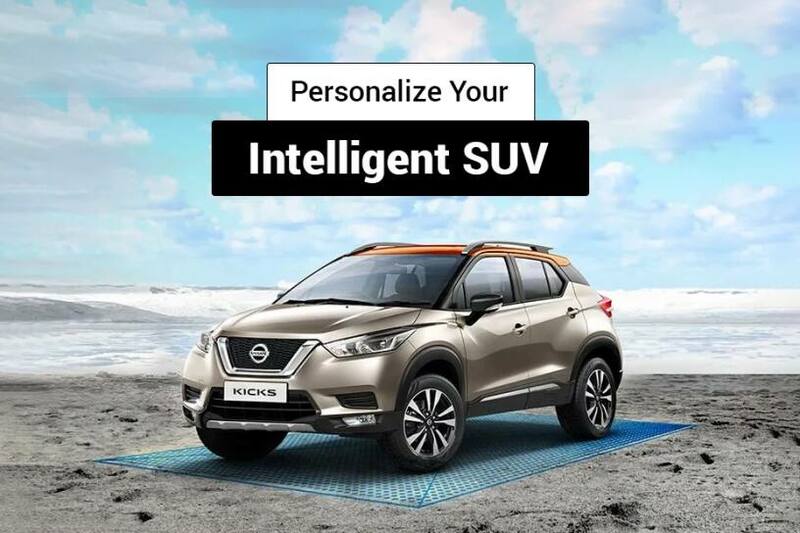 Stylish graphics: If the Nissan KICKS’ standard design leaves you desiring for a bit more flair, you can opt for some roof graphics - dotted design or honeycomb pattern. There are side decal options too that run along the bottom and the waistline that jells perfectly with the KICKS. Added ruggedness: If physical mobility is a concern while entering or getting out of the KICKS with its 210mm of ground clearance, owners can fit this SUV with side steps with Nissan lettering. Extra cladding garnish on the tailgate entry with the KICKS lettering on it protects it from getting scratched while loading or unloading items from the boot. Premium chrome styling: If you like a bit more bling, the KICKS also has a range of exterior chrome accessories for areas such as the front fog lamps, front air dam and tail lamps. Set the mood: What’s more, you also have the option to choose between different light colours that light up the footwell area and the LED scuff plate according to your mood, via the Nissan mobile app. Enjoy privacy: Should owners use the Nissan KICKS to be chauffeur-driven, it can be equipped with side window curtains as well as a rear windscreen curtain for added privacy and protection from harsh sunlight. Comfort: The accessories list goes on to offer more personalization options such as a variety of designs for the leatherette upholstery in the form of seat covers, floor mats and artificial leather steering wheel covers with multiple options to choose and personalize according to your choice & taste. The Nissan KICKS’ promise of peace of mind ownership goes beyond the features that make it such a tempting car to buy. On top of the standard two-year warranty, Nissan also offers an additional 3-year comprehensive value package to cover an extra three years extended warranty and maintenance too. The worries of rising service costs or expensive repairs are also covered by these benefits thanks to the low-cost maintenance package for up to 5 years or 50,000 kilometres while the warranty covers a period of up to 5 years or 1 lakh kilometres.